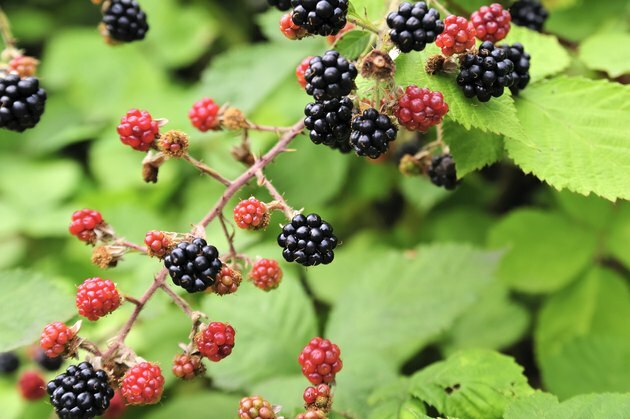 Sweet and juicy blackberries are more than just a tasty treat; they're also full of beneficial nutrients and phytochemicals that boost your health. You can incorporate blackberries into your daily diet by tossing them into oatmeal, yogurt or salads, and they make a satisfying snack all on their own. Blackberries are low in calories and high in nutrition, so they're an excellent part of any weight-loss strategy. One cup of fresh blackberries has just 62 calories and provides 30.2 milligrams of vitamin C. A cup of blackberries also has 7.6 grams of fiber, which helps induce feelings of satiety so you don't get hungry again right after eating. Other nutrients found in blackberries include manganese, vitamin K and folate. Because they are sweet, blackberries can be used as a healthy dessert alternative when you're on a diet. They're also low in sodium, so they're perfect for people on salt-restricted meal plans. When you eat blackberries, you're giving your body a dose of germ-fighting ellagic acid, an antioxidant compound with anti-viral and anti-bacterial properties. Each dry-weight gram of blackberries has 3.69 milligrams of ellagic acid. The vitamin C in blackberries also may help your body fight off germs. According to the National Institutes of Health, vitamin C helps your immune system function properly to ward off disease. When it comes to keeping your brain healthy, eating blackberries is a smart move. A 2012 review published in the "Journal of Agricultural and Food Chemistry" looked at data from human, animal, and cell culture studies and found that berries, including blackberries, benefit the brain in a few different ways. In addition to being high in antioxidants that fight free radical damage in the brain, blackberries also affect cell signaling between neurons and reduce cellular inflammation. This improves the functioning of neurons involved in both thinking and motor control.